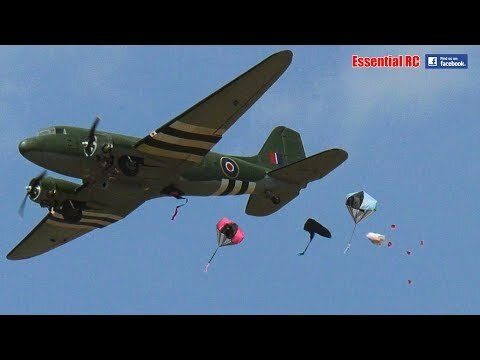 ﻿ Radio Controlled (RC) PARACHUTE DROP ! Radio Controlled (RC) PARACHUTE DROP ! Several scale radio controlled (RC) aircraft in this video filmed at the Large Model Association (LMA) Cosford Show 2018. The highlight being a parachutes drop ! Filmed as LMA Cosford Show 2018 by Dom Mitchell for the 'Essential RC' YouTube channel using the Panasonic AG-UX180 Pro 4K camcorder. Radio Controlled (RC) Biplanes !